The purchases made on italimpianti.it are 100% safe and guaranteed as they are aligned with the most advanced technologies for security on the web. The banking practice provides that the bank transfer is credited to the account of the beneficiary (Italimpianti Orafi Spa) no earlier than 5/3 days from its execution. After 10 days from the date of acceptance of the order (date on which you receive the order confirmation by e-mail or by phone) without having received the credit of bank transfer, Italimpianti Orafi Spa will cancel the order. 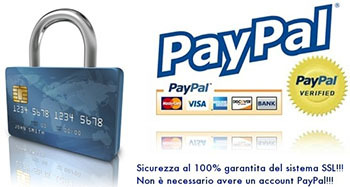 For every transaction made with this method are sent an e-mail confirmation from PayPal. At the time of the order the amount is debited from your PayPal account or the relevant account associated with the credit card.